In a surprise move, yesterday after the close of the stock market, Deutsche Bank announced that the increase their capital by ~2.8 bn. For this they used the possibility of selling up to 10% of new shares without granting rights to the old shareholders. The closing price of Deutsch Bank was 33.60 EUR. The price for the new shares 32.90 EUR. Outstanding shares were 929 mn, new shares 90 mn. (33.60 * 929 + 32.90 * 90)/ 1019 = 33.53 EUR per share. Reality check: The stock actually opened around 33.50 but is now up +7.5% at ~35.40 EUR. The stock market is full of surprises. For some reason, the capital market considers it as extremely positive that Deutsche Bank increases its share count by 10%. I don’t know why. And: Don’t rely on formulas……. We recommend shorting KPN on the share issue announcement. The equilibrium price is Eur 2.04/share and the stock price should trend toward this level in the near future. Equilibrium Price = (price pre-cap raising announcement x # shares + price cap raising x # shares) / total # shares. The shares were trading at around 4.0 pre-announcement and there were 1.431 bn shares outs. fundamentals are slightly better now than they were before, and we set our target at 2.20-2.40, or 10-20% lower than the current price. The stock should be sold/shorted. “Wow, they are professionals and have a formula, this must be right” was my first thought and I briefly thought that I have made a mistake. Although I had a nagging feeling that the formula (or the application of it) was not right. ok…I join the game. When the capital increase was announced the share price was Euro 3,1…so 3,1+1,06+1,06/3 = 1,74. If the dust settles this share price is my personal target…more I do not expect . The day BEFORE the capital increase was announced, the stock price was 4.10 EUR. As there were cost for KPN real economic discount is somewhat lower. Martin and JM (by the way, thank you for your many helpful comments) are using the very same formula, however with one big difference: They compare the result with the stock price AFTER the rights have been split of. So the question is: Who is right ? The “professional” reasearch on Bloomberg or the comments on my amateur blog ? Well, if you are a KPN shareholder before and KPN would sell the new shares directly to new shareholders at 1.03 EUR per share, then of course the old shareholders would be massively diluted. In reality however, no one is able to by the shares directly at 1.03. You can only access those cheap new shares by buying the subscription rights which have been giving to the old shareholders as compensation for the dilution. So the big mistake made by the “professional” analyst was that he somehow forgot to account for the subscription right. as the subscription right was worth 1 EUR pr share, suddenly an overvalued share according to the “professional” is an undervalued share. How can a “professional” be so stupid ? My guess is that the “analyst” mixed u a rights issue with an issue of shares without rights. Companies usually can issue a certain amount of shares (usually max. 10%) directly to new shareholders without any rights to old shareholders. In those cases, the announcement is usually made shortly before the trading day starts and then the formula above is applied to the price the day before and the price for the new shares. I think all three assumptions are quite difficult to hold for the KPN rights issue. Talk about the issue started already in September last year, so at the time of the announcement (Feb. 5th), the stock price reflected already a part of that. Also, the time period between announcement and pricing of the issue is quite long with 6-7 weeks. It is amazing, how bad some of the “professional” research actually is. In that case the analyst used a formula without accounting for the subscription rights. However this also shows that in those situations, the price discovery might be not fully efficient. I wouldn’t put too much faith into the “formula”, as the application towards rights issues really stretches the implied assumptions. In his third popular book (after “Fooled by Randomness” and “black Swan”), Taleb now introduces a new concept called “antifragilty”. As in the first two books, in his opinion on the big scale, the world is shaped by “black swans”, totally unpredictable events. Something that gets hurt by those Black Swans is fragile. Someone/Something that is not hurt by Black Swans is robust. 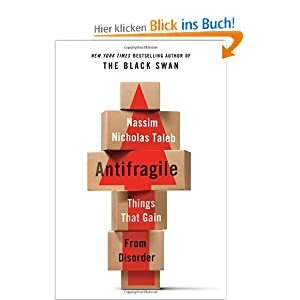 Antifragile finally is something/someone that gains from the chaos a Black Swan event is creating. So far so good, however if one would have expected some implications for an investment strategy, one gets almost completely disappointed. At some points, financial markets are mentioned, but not very often. Instead, the book is more a “Paleo” style nutrition and work out guide than a finance or investment book. Taleb shares his never ending wisdom with the readers, on topics like why the Greek philosophers were idiots (or not so smart as Taleb) to all kind of medical advice and why you shouldn’t eat oranges because the are much sweeter than 3000 years ago (hint: the only way is to eat the stuff a cave man would have had access to…). From time to time he looks at two fictional characters called Nemo and Fat Tony. If we assume that Nemo is his alter ago, we know now at least that Taleb made a “low 2 digit million” amount of money when he bet against the financial crisis. Don’t get me wrong, there is some good “common sense” wisdom in the book, for instance that one should not take medical studies to seriously, but in total I found the book pretty much a waste of time. Maybe I am not intelligent enough to appreciate Taleb’s genius, but for a pure mortal like me the book looks like the attempt, to cash in on the same idea for the third time. In the view passages about investing, Taleb promoted very vaguely a style he calls the “barbel” style: Invest most of your money in “safe” assets (whatever that is) and a small part in risky stuff with lots of optionality. Although he mentions that financial options is not what he means because they are mostly overpriced. I think this kind of “advice” shows the major issue with Taleb: He is by heart a trader, not an investor. Otherwise he migth have mentioned that “Buffet style” long term compounding plus margin of safety is a much easier way to become “antifragile”. But that wouldn’t sell as many books and create invitations to speaker events and hobnobbing at the Davos Forums. Unless you are a big Taleb fan and you need his advice on how and what to eat and work out, don’t buy the book. Save your time and money for something more interesting. Will Google Fiber kill both, Cable and TelCo carriers ? I have covered KPN as a potential “deeply discounted risghts issue” special situation in the past. What I find very remarkable is that there is only a very short time period between announcement of the terms and the start of the trading of the rights. Basically they announced today and trading starts tomorrow. For the portfolio, I will start with a 1% investment as a rather “short term” special situation based on current prices of around 2.61 EUR per share. Lets wait and see how that one works out. As one would expect, the company would not give any details of proposals being discussed with stakeholders; however, the company admitted that it had considered a number of options for repaying the convertible and deleveraging the company (which became necessary when the synloan holders indicated they wouldn’t be able to refi in September 2014)… including a rights issue which wouldn’t work due to the size required and the status of the hybrid and a quickie disposal of the SQUAIRE which would have seen a very significant discount to book. The German market is relatively short of ‘prime’ office space… prime would mean significant property located in the centre of major cities like Berlin, Frankfurt, Hamburg and Munich. IVG categorises most of its property as located in these cities. However, more properly it should be described as near one of these cities and very little of the investment portfolio could be described as prime… Prime properties still command premium rentals, non-prime properties face significant competition and rents are likely to fall on the renewal of tenancy agreements. The company states that €2.25bn is core/core+, €690mn is value add (needs work or on short tenancy) and €250mn is workout… in an insolvency the core/core+ valuations would come under pressure; the latter two categories may well be reflective of a going concern but I believe could well be significantly haircut in an insolvency… Furthermore I place little value in the €264mn ‘future caverns’ given the lack of interest from utilities; the fund valuations could come under pressure if EuroSelect 14 does indeed default; and tax assets are hard to transfer. It would seem that it would be in the best interests of all of the stakeholders to keep the company a going concern, otherwise one can make a case that even the collateralised parts of the syndicated loans could be haircut. This is the same kind of b…s… I have heard in the first few Praktiker calls. The answer is simple: Nope. The first step is that equity gets wiped out, then Hybrid then senior. However it clearly shows that will go down the same path as Praktiker tried and ask the bondholders for deferral. If for some reason, they would succeed, this would in my opinion kill the complete (high yield) corporate bond market. If it is suddenly possible to change the sequence in teh capital structure, why should then be corporate spreads where they are at the moment ? In some boards people were arguing: If a collateralized loan is sold at 85%, this is the proof that the senior is worthless, as even the collateral for the first priority loans is not sufficient. To be honest, I was struggling with that one most. Well, this argument now doesn’t hold anymore. If in reality, the Synloan is only collaterallized at 75%, then a price of ~85% is in line with the current pricing of the convertible. The uncollateralized part of the Synloan is “pari passu” with the convertible. So in case of the bankruptcy, synloan holders would get full repayment on the collateralized part (75%) plus pro rata repayment with the convertible which trades around 55%. The “fair value” of such a Synloan would therefore be 75% + (25%*0.55)= 87.5% and therefore absolutely consistent with current convertible prices. If we assume that the buyers have quite high return requirements, then I think the fear of a zero recovery for the convertible gets even more unrealistic. If only for this one piece of information, the “research” as superficial as it is has greatly increased my confidence in the IVG convertible, because suddenly the prices paid for the more senior but partly uncolateralised loans makes sense. One should still expect a very bumpy ride with “Praktiker style” attempts to bail in the convertible holders before anyone else, but at current prices, the risk/return relationship looks very good to me. Again a disclaimer: “Don’t do this at home” and I might be subject to confirmation bias. Thanks to reader N. for submitting this !!! (5) they define strategy as following best practices. 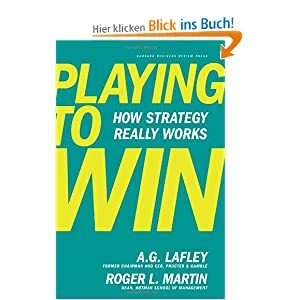 Lafley and Martin suggest that a strategy “is a coordinated and integrated set of five choices: a winning aspiration, where to play, how to win, core capabilities, and management systems.” The authors argue that what really matters is winning, and that the play book discussed in this book, which provides five choices, a framework, and a process, is what is needed to win. In subsequent chapters, the authors present the “strategic logic flow” framework, designed to direct thinking to the key analyses that inform any strategy, and the “reverse engineering” methodology, designed to make sense of conflicting strategic options. In the former, there are four dimensions to be considered: (1) the industry, (2) customers, (3) relative position, and (4) competition. In the latter, which contrasts with traditional approaches to generating buy-in, there exist seven steps that involve exploring different ways forward and a wider variety of possible strategic choices. If strategy is a set of choices, how the author write it “that uniquely positions the given enterprise so as to create sustainable advantage and superior value relative to the competition,” and I believe it is, then quality of judgment is imperative, not only when making a specific choice but throughout a continuous and cohesive decision-making process. As a conclusion of their book, A.G. Lafley and Roger Martin acknowledge, “All strategy entails risk. But operating in a slow-growing, fast-changing, intensely competitive world without a strategy to guide you is far riskier. Leaders lead, and a good place to start leading is in strategy development for your business. But they state also, and I think that this is most importantly, “no strategy lasts forever”. So one of the best takeaways from what the author writes in that book is that “strategy is a highly dynamic area, full of fads and fashions that come and go”, and that “copying ideas that ‘work’ for others is unlikely to be a winning strategy”, because “success can only be based on being different from (existing or potential) competitors”. In addition, I appreciated the “Dos and Don’ts” sections at the end of each chapter, which clearly summarize the material from a practical context, as well as the strategic lessons learned side bars following these sections at the end of most of the chapters. At some level, I find the book a little bit to repetitive. I don’t think that a brief review such as mine, can possibly do full justice to the scope of material that A.G. Lafley and Roger Martin provide in this volume at as they did in it in their book. Also, I hope that those who read this review will be better prepared to determine whether or not they wish to read the book. I truly can recommend this book because you will have at least some idea of how an enriched and enlightened understanding of what strategy really is and the book perfectly fits to “Competition Demystified” from Bruce Greenwald.